Active the Sprout Billings plugin. 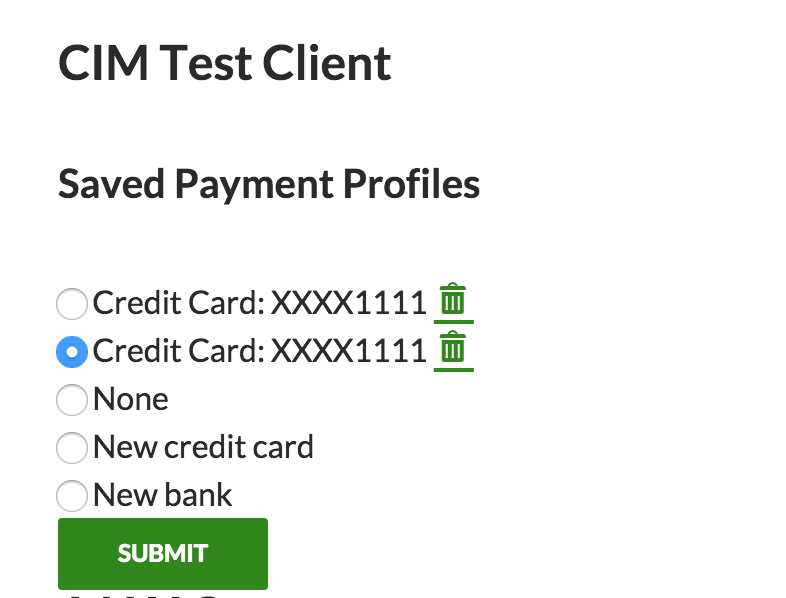 Enable one of the three new payment processors: Stripe Profiles, Authorie.net CIM, or NMI. Disable any other payment gateways, since they are not compatible with Sprout Billings. Note: PayPal and any other payment can be used in conjunction, however any auto billing features will not be compatible, only a payment can be accepted. Client will have the ability to select from any save payment profiles or add new payment profiles when paying an invoice. This includes an option to add a bank transfer as a payment option. The client will need to approve for their payment profile to be used automatically in the future. Notes: The latest payment profile used (with terms accepted) will be the default. Clients can switch their default payment method on the payment dashboard (see below). 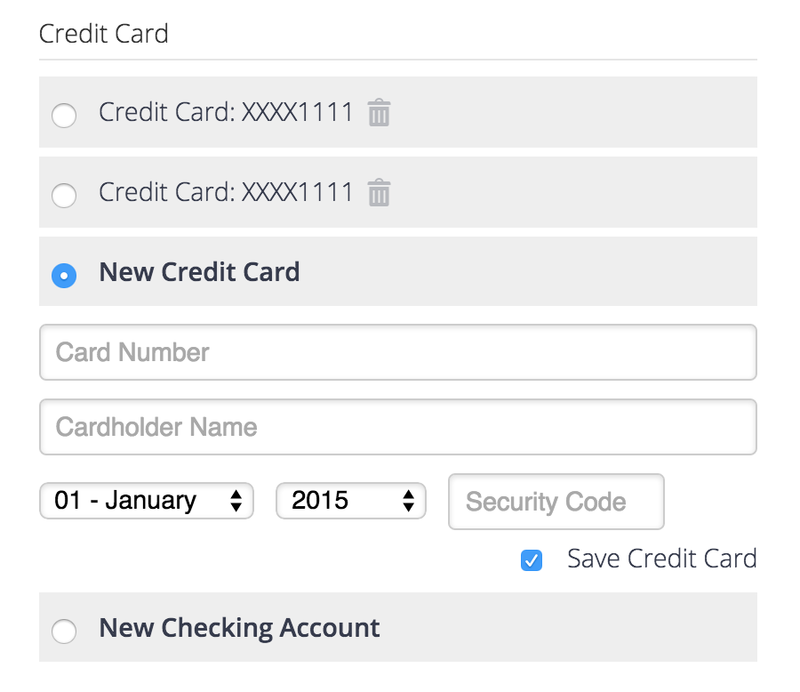 In v3.0 of Sprout Billings automatic payment capture was simplified, although an important feature was added. Now the client selects when the payment should be made. A client must agree to the terms, " I authorize...", for a payment profile to be auto billed. Payments are automatically captured on the Auto Pay date selected for any invoice with a past due date. Examples: Invoice due date is the 2nd, Auto Pay is set to the 4th, an auto payment will be attempted on the 4th; if the due date is set to the 5th, but the Auto Pay date is the 4th, than the auto payment will be attempted the next month on the 4th. Notifications are sent when an auto payment is attempted. See below for more details. The "Attempt Payment" buttons are available for any invoice with a client that has an approved payment profile. A payment can be attempted from the invoices admin, or the individual invoice admin. The client has the ability to manage their payment options via a dashboard that is outputted with the shortcode sprout_invoices_payments_dashboard. This can be on the client dashboard page or a different one that only logged in users can view. The client dashboard is updated to include a "One Click Payment" button. Auto Payments Not Setup - sent to the client when an automatic payment is attempted but their profile is not setup. Auto Payments Failed - sent to the client when an automatic payment fails. Auto Billing Failed - sent to you when an automatic payment fails.